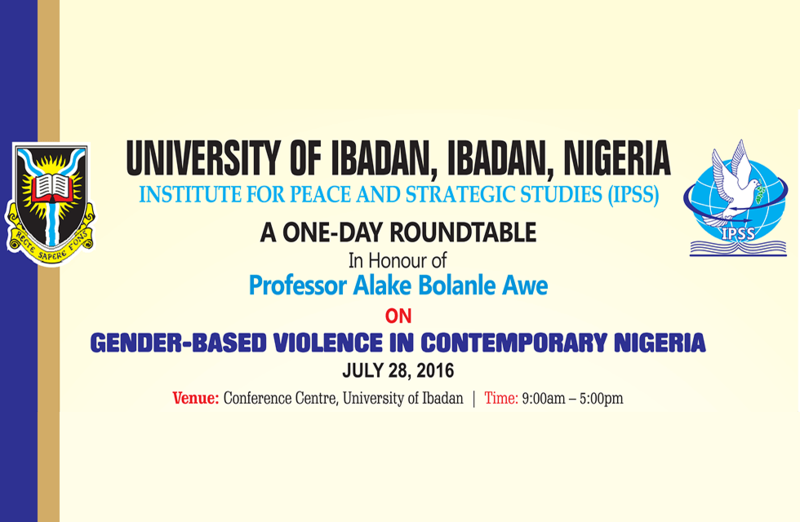 The Institute for Peace and Strategic Studies (IPSS) of the University of Ibadan is organizing a roundtable on the theme of gender-based violence in contemporary Nigeria on 28 July 2016. Gender-based violence is an umbrella term for any harm that is perpetrated against a person’s will and that results from gender-related power inequalities in both public and private spheres. Though the problem is experienced by both the feminine and masculine gender, it is more peculiar to women and girls. To this extent, “gender-based violence” is sometimes used interchangeably with the term “violence against women” (VAW). VAW occurs throughout the lifecycle of a woman and manifests itself physically, psychologically and structurally to include such objectionable human experiences as genital mutilation, forced marriage, humiliating widowhood rites, sexual violence, domestic violence, legal discrimination, socio-political exploitation. Recent media reports points out in the direction of a dynamic change in the nature, impact and management of this problem in Nigeria with notably a rise in cases of sexual slavery as well as kidnapping of women and girls. Nigeria needs to find actionable solution to those problems. The starting point is to gain a better understanding of the issues by asking inter alia the following questions. Why gender-based violence and how does it manifest itself in different contexts? What efforts are being made to prevent and manage the problems and what are the existing best practices across the country?